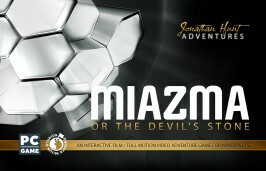 MIAZMA or the Devil’s Stone was created by award-winning Hungarian game developer Private Moon Studios in the framework of the project Distribution of Atomki’s scientific results – understandable-available physics. MIAZMA is a Jonathan Hunt Adventure: a sequel to Yoomurjak’s Ring – the first computer adventure game ever released as a tourism marketing tool. Jonathan Hunt is an American journalist working in Hungary as a local correspondent of a major newspaper. He arrives in Debrecen for a long weekend, not suspecting that his planned leisure trip will become an investigation for a missing boy and a most peculiar meteorite. It is for him to discover what the devilish “thunderbolt” hides: a huge diamond, an elixir of immortality or an unknown, destructive substance. MIAZMA features a great story and dozens of puzzles to solve, most of them related to the science of physics. The game, being an edutainment product, offers learning while playing. Controlling the main character, you rely on the virtual help of Atomki’s scientists and instruments, and put into action your basic knowledge in physics. The game takes you to real locations with live-action cinematic approach. It lets you explore some of the main attractions in Debrecen and the laboratories of Atomki, getting a glimpse of the work going on in a nuclear research institute. This is a limited edition of the game, distributed by the sponsors only, with an activation code on a plastic card shown below. If you have this card, use the code to activate your personal copy of the software on a single computer (PC).